Get a real belt for lifting real weights! Powerlifting belts are great! 10 cm wide all the way round, 10 mm thick! Any other type of weight-training belt is really just a piece of string! Get a Heavy Duty Power belt and lift some real weights! What do I mean by real weights? Here is big Dave Napper dead-lifting 320 kg (over 700 lbs) in www.danbakerstrength.com belt. Dave competes in the strictly drug tested IPF power-flifting federation and in Strongman. Because he was the first person to dead-lift >700 lbs in our belts, I had to give him another one! How do belts work? – They create “hoop tension”, the same as the metal hoops that surround old wooden barrels. This stops the splaying of forces outwards and redirects them upwards. This really saves the lower back and hips. If you are going to squat or deadlift heavy, get a real belt, it is the single most important item I sell or recommend for those who lift heavy! I still use the belt I bought in 1997 and it is in great condition. Hell I even have one belt that is 30 years old and it is still going strong. We had belts at the Broncos 15-19 years old, being used by 40-60 gorillas a day! These belts last – $70 spread across 18 years = < 10 cents per week! What an investment! Introducing our new QUICK RELEASE power belts @ $70. We now have Quick Release belts in four sizes. See the photo at the bottom of the page to determine which size belts you should get. 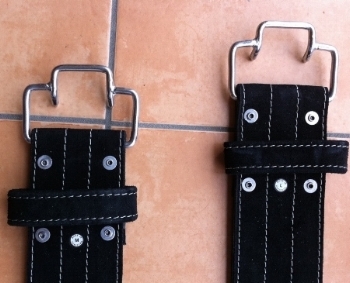 These are the Quick Release buckles. The Quick Release buckles were originally developed by powerlifiting legends Randy Wilson and Fred Hatfield. What size belt should I get? Measure your waist, then see the photo below with the different measurements for the belts. Double click the photo to enlarge it and make it more clear to see the exact measurements of our belts. Remember that when belts are brand new, they are very stiff and may seem that they don’t fit you well! But if you use the photo below and have made an accurate measurement of your waist, the belt will fit. It takes a few training sessions for the belt to loosen up and fit your waist more snugly! Size 36, waist size 54 to 79 cm, generally suits athletes 40-50+ kg. This belt fits small females. Size 40, waist size 66 to 91 cm, generally suits athletes 50-80+ kg. This belt fits most females and smaller males. Size 44, waist size 78 to 105 cm, generally suits athletes 80-100+ kg. This belt fits most males. This is the size I am wearing in the photo above and in the videos on the website. Size 48, waist size 93 to 1117 cm, generally suits athletes 90-115+ kg. This belt is for the BIG BOYS! This is the belt Dave Napper is wearing in the deadlift video above! He is 125 kg, but is in the last hole!